Q1. How to use apropos? Q2. How to make apropos search for exact keywords? Q3. How to make apropos display entries matching all keywords? Q4. How to force apropos to not trim output? Q5. How to interpret apropos exit status? In Linux, if you ever need help regarding a command, all you need to do is to open its man page. But what if a situation arises wherein the requirement is to quickly search the names and descriptions of all available man pages? Well, Linux has got your covered, as there exists a command dubbed apropos that does exactly this for you. In this tutorial, we will discuss the basics of apropos using some easy to understand examples. But before we do that, it's worth mentioning that all examples here have been tested on an Ubuntu 16.04 LTS machine. The  database  searched  by  apropos  is  updated by the mandb program. Following are some Q&A-styled examples that should give you a good idea on how the apropos command works. Basic usage is simple. Just pass the keyword you want to search as input to the apropos command. Of course, you can pass multiple keywords as well. By default, the input you pass to the apropos command isn't searched exactly. For example, if you pass 'who' as an input, you'll also see the tool producing results containing words like 'whoami'. So this isn't an exact search. 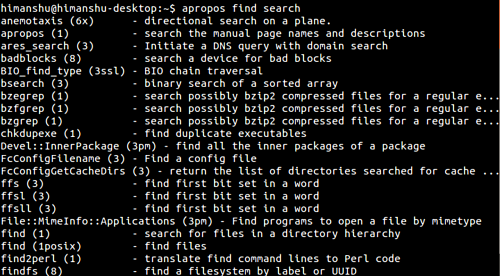 However, you can force apropos to search for exact keywords by using the -e or --exact command line options. So now you see that only those entries that exactly match 'who' were displayed in the output. If you pass multiple keywords as input to the apropos command, the tool will output entries that match/contain at least one of the keywords. However, if you want apropos to produce only those entries that match/contain all keywords, then use the -a command line option. However, if you want, you can force apropos to produce complete lines in output, something which you can do using the -l command line option. 1      Usage, syntax or configuration file error. Depending on your work profile, you might not require the apropos command on daily basis, but as you'd have understood by now, it could be a lifesaver in certain situations. We've discussed some use command line options here. 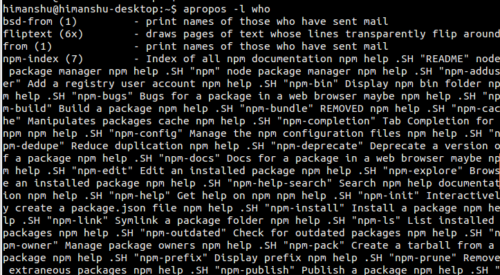 To know more about the tool, head to its man page. but.......I couldn't understand the difference between " apropos -e mkdir " and "apropos -e mkdir"